'Oak Knoll'. 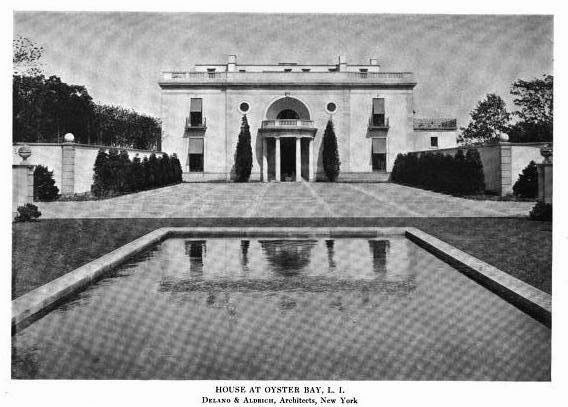 the Bertram G. Work estate designed by Delano & Aldrich c. 1916 in Mill Neck. Click HERE and HERE for more on 'Oak Knoll'. The estate is still on the market for $12,800,000, click HERE to see the listing via Daniel Gale Sotheby's. Click HERE to see 'Oak Knoll' on bing. 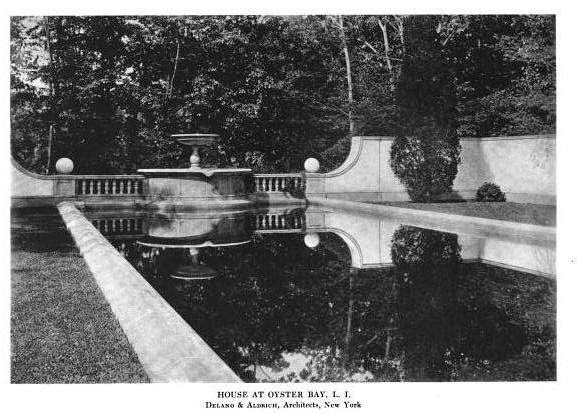 Photos from the Year Book of the Architectural League of New York, 1920. Has the benefit of beautiful design, a gorgeous hilltop setting and well integrated landscaping and gardens that really make this one of the jewels of LI estates. That may be the best one car garage I've ever seen. was replaced with a buried tank when a new well was drilled by the garage. the garage was designed with two horse stalls and a carriage facility on the north wing. Mr. Work lived in the south wing while the house was built. The interior parking yard was not quite big enough to play tennis on.Could park six cars with room to spare. The best of the best. If this was England, it would be purchased with monies from one of the various national funds to preserve it for the nation. This is not England. This is off topic, but since Peacock Point was featured recently- I went to a Glen Cove Museum lecture last night. Harry Trubee Davison was the speaker. He is the grandson of F.Trubee Davison. He presented part of a wonderful documentary he made on the "Millionaires Unit" flyers during WWI. It will be televised on channel 13 in the near future. Don't miss it because it's really great. I told him about this website and asked him if he has any pictures of his former house. He said that he does have pictures and would be happy to share them. I am passing on the link to the website to him. It's so great that relatives who actually lived in these houses are still living around here. He said that he lives in the former superintendent's cottage. OT - but Walter P. Chrysler Jr's former estate in Virginia (dad owned the Forker House in Kings Point) sold 9/30/14. The 1,400+ acre estate with 38,000sq ft stone mansion (orig c.776 and expanded) plus lovely stables and carriage barns plus miles of trim 3-pannel fences and roads went for $21M. The buyer was David B. Ford who also purchased (record breaking too) the Newport RI mansion "Miramar" by Trumbauer.